October 28, 1988. From its source to the gauging station 800 feet upstream from the intake of McAllister Ditch. Wild — 6.6 miles; Scenic — 8.8 miles; Total — 15.4 miles. The name Whychus, meaning "the place we cross the water," was chosen for the creek based on its strong historical and legal usage. 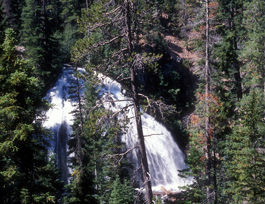 The three forks of Whychus Creek begin in the Three Sisters Wilderness on the east slope of the Cascade Range in Central Oregon. The river’s outstandingly remarkable values include geology, hydrology, fish, scenery, prehistory and traditional cultural use. Glacial and volcanic events have created complex and diverse landscapes, including steep and narrow canyons, deep bedrock canyons, numerous waterfalls and a variety of channel shapes and gradients. The fish populations are regionally significant due to the presence of a native strain of Interior Columbia Basin redband trout with little genetic influence from hatchery fish and the imminent reintroduction of federally listed “threatened” steelhead. The wild, unmodified scenery of the corridor is unique in the region, with distinctive visual elements provided by the change in elevation and varied geologic features. The headwaters of Whychus Creek, the glaciers on the Three Sisters Mountains, are a symbol of Central Oregon and widely photographed. Whychus Creek has a long history of use by Native Americans and provided a travel corridor to and from obsidian sources in the high Cascades. Traditional use by Native Americans is well-documented.